My first attempt to visit Rabkoland took place a little under two years ago, when I was forced to abandon the park due to a combination of bad luck and unrealistic assumptions about driving conditions in Poland. This year I planned a lot of spare time into the itinerary, almost none of which proved necessary. On arrival I decided I'd kick off my visit by doing what most of us do after several hours of driving, but I quickly discovered that this activity wasn't possible inside the park. 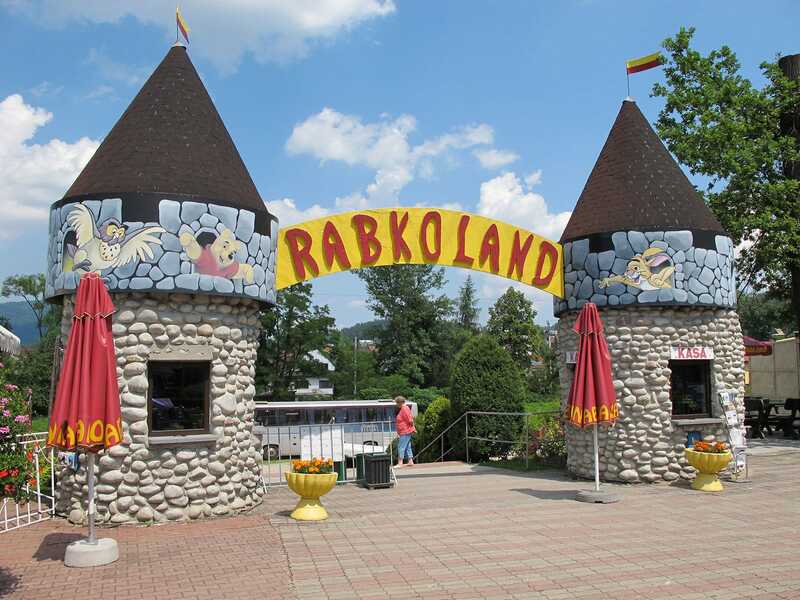 Rabkoland does not have a restroom, and guests are invited instead to go to one located in a standalone building outside of park bounds. An admission fee (cash only) is required, and if today was anything to go by this money does not go towards cleaning and general maintenance; let the reader beware! Information on the internet had led us to expect a spinning coaster at the park, but sadly this proved to be incorrect. The sole member of the kolejka górska family was a rather scary looking oval shaped ride named Lux Torpeda (#1528). It turned out that standard ride tokens were not valid on this ride, despite the ticket price being the same as for everything else. Once we'd worked that out we were treated to a half circuit in each direction before an interminable number of forward circuits of the course. Though fun, once was more than enough. The rest of the park was far more visually appealing than the dilapidated coaster, with bright colours in all directions. The giant wheel was of particular interest, being a model that doesn't actually stop for passengers to load, rather akin to an antique version of the London Eye. There was also a rather unique haunted dark ride with some neat effects inside. The drive system was shuddering rather badly today, though all that really did was enhance the generally scary atmosphere within. An hour south of Rabkoland is the charming village of Kluszkowce, home to one of two known alpine coasters in Poland. The roads in the immediate vicinity of this ride were under reconstruction today, which made the approach route more than a little exciting. Be that as it may, we saw two coaches in the car park, which says a lot about the sanity level of local drivers. Kolejka Górska is a Wiegand model, somewhat shorter than those I've ridden in other places, but well formed nevertheless. The vehicles on this model had extra padding than is the norm, which allowed the course to be comfortably enjoyed at full throttle from top to bottom.